How do I best care for my senior pet? Even if you think that your pet is doing well, a physical exam can help detect early stages of disease as well as give your veterinarian the opportunity to discuss disease prevention methods with you. We encourage "continuity of care"- meaning that it is important for your pet to see the same veterinarian on a consistent basis. 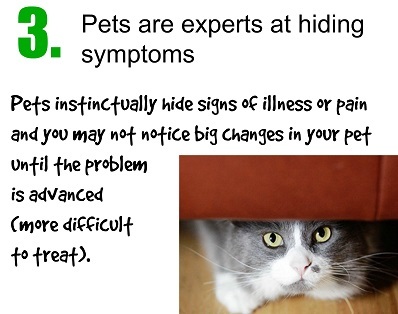 Pets can't speak for themselves, so it is important for your veterinarian to see your pet when they are well so that they understand the severity when they are ill. While there are a lot of marketing trends and fads out there, one thing that doesn't change is that senior pets have different nutritional needs than puppies/kittens or even adults. 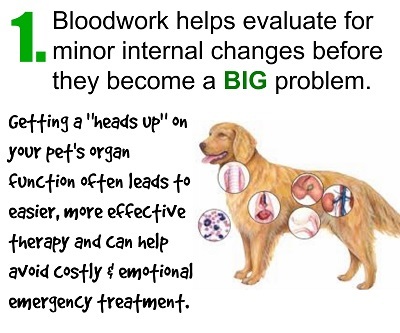 Talk you your veterinarian about specific recommendations depending on your pets current health level. Senior pets with arthritis or other joint diseases can easily become overweight as they become less active. A healthy body weight can decrease pressure on joints and also decrease risks of heart disease and diabetes. **A 2002 study by Purina followed a group of dogs for 14 years and found that dogs kept at a lean body weight had a 15% increase in their lifespan- this equates to 2 extra years. Other seniors may have trouble maintaining their body weight. Talk to your veterinarian for recommendations if your senior pet has unintentional weight loss- this can be an indication of internal disease.